This morning Jen went to get some milk for her coffee. When she opened the fridge she was greeted with a horrible surprise! Jen complained about this incident in great details. 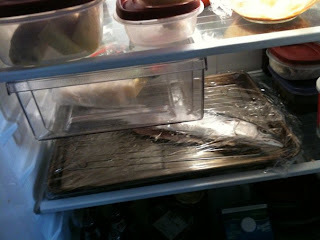 She even insisted that the fish was "flopping around" in the fridge. I believe that this is an outright lie. Nonetheless she felt threatened by the presence of the fish. While I'd hoped to just leave it in the fridge indefinitely as a sort of pet/mascot, I decided I would have to take action and defend her from the fish's overt oppression. I took action by zesting an orange and a lemon and then coating the inside and outside of the fish with the zest, salt, pepper, garlic, and olive oil. I stuffed the cavity with citrus slices, red onion, and parsley then roasted it in the oven. As an accompaniment: more potatoes from Kent, Connecticut. After vanquishing the evil fish from the fridge it was me time. That meant celebrating with a victory Lion Bar. To the vitory go the spoils. That mackerel looks tasty! 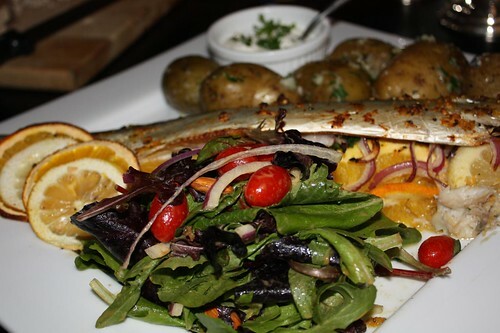 I love mackerels, they're such an underused fish, yet so plentiful and inexpensive. Really, we need to spread the word on macks!